I was on a shopping kick this past weekend and stumbled upon this fun shade in Urban Outfitters. 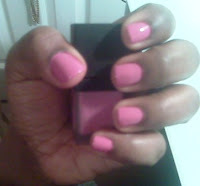 Though it's technically called "Matte Purple 3" this shade is close to a bubble gum pink. For those that love matte colors, this one is nice as it offers an all-in-one matte effect w/o the need of a matte topcoat (like Matte About You by Essie). It only took 2 coats to get the shade to pop and the application was fairly easy and clean. Urban Outfitters carries a bunch of colors and they're 2 for $8 so feel free to experiment.